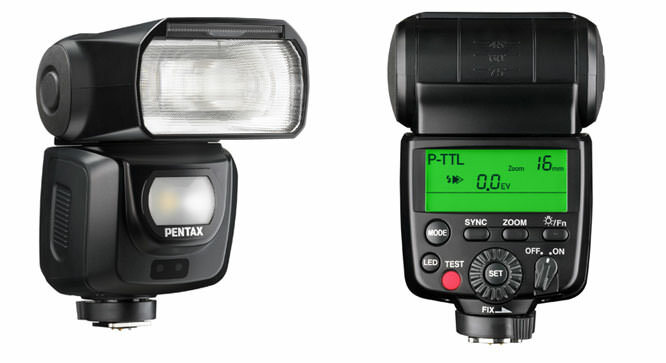 Flash units for Pentax interchangeable lens cameras have been announced. The AF540FGZ II and AF360FGZ II are two new weather-resistant auto flash units designed to be used with Pentax interchangeable lens cameras with a maximum guide number of 54 and 36 at ISO 100m. These units are designed to provide solid, dependable operation even in difficult weather conditions including rain and fog. With 28 seals applied to crucial parts of the unit body including the hotshoe, these flash units feature highly dependable weather-resistant construction. By coupling one of them with a camera body and a lens that feature the same weather-resistant construction, the user can create a highly reliable weather-resistant digital imaging system that assures solid performance even in difficult weather conditions, such as in the rain or in situations where the product is subject to splashes and dust. The user can customise the flash operation by presetting as many as nine different preferred flash functions, including the on/off of the catch-light function using the LED light and the choice of the flash discharge mode in still-image shooting. Both models provide a variety of flash discharge modes,** ranging from the advanced P-TTL auto flash mode in which the flash’s preliminary emission is detected by the camera’s light sensor to accurately control the main discharge level for proper exposure, to manual flash, high-shutter-speed synchronisation and wireless P-TTL auto flash.